Manchester United could reportedly get their hands on Napoli's Kalidou Koulibaly in January, should they part with a world-record fee for a defender. 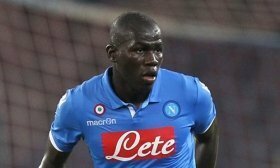 The Senegal international has emerged as the club's prime target for the New Year but it appears that he won't come on the cheap after only recently signed a new contract with Napoli. According to The Times, the Naples outfit are willing to part ways with their leading defender at the turn of the year but United will have to pay a fee of around £90m for the deal to go through. Liverpool's Virgil van Dijk is presently the world's most-expensive defender after his £75m switch from Southampton during the 2018 winter transfer window. United returned to winning ways in the Premier League on Saturday where they secured a comfortable 4-1 win over Fulham, who are at the bottom of the standings. The victory has witnessed them jump to sixth on the table with an eight-point gap to the final Champions League spot which is presently occupied by Chelsea.